There are a few things that do and don't surprise me here. But I think the big takeaway from this is that we're amazingly cognizant about how we arrived at our weight. We can apply the same awareness to removing it, no? I guess the follow-up question is: "Do you think you are restricted by your genetics? Do you think that you are destined to be overweight/obese, and thus, powerless?" Your genotype (genes) doesn't always restrict your phenotype (outward expression of genes) but it can inform it. It's up to you to determine whether you're going to let a few chromosomes dictate your health and happiness. I'm not surprised at all by this -- but again, there's the follow-up: "If depression was/is an issue for you, have you addressed the root of the problem? Unless you address the root of the problem and/or mask it with food and quick fixes, you'll never experiene the victory that you deserve. Re growing up/parentes -- that was the past. What are you doing to forgive them for being imperfect and moving on to how you can change this not only in your life but the lives of people around you (especially if you have children)? As an adult you have more power to dictate your environment (home, work) than you think. Figure out what you need and then enlist help and support. You do not have to remain in an environment that is unhealthy for you. Do not feel powerless to change this. Just because you're making a change doesn't mean other people need to follow suit, but you may just find that you're the inspiration they need to live a healthier life. Well this really gets to the heart of it all, doesn't it? What do you all do to measure both sides of the equation? You all know I use the BodyMediaFit system, but for as much as I love it -- if you think it's too expensive and don't want to use it, there are other ways to measure not just your activity levels, but your intake levels. Get familiar with measuring equipment (food scales, measuring cups/spoons, and eventually the ability to estimate) as well as portion sizes. For activity, there are online calculators to determine your BMR + HBE (i.e. how many calories your body burns on average) + estimates for physical activity. So half of the equation is knowledge; the other half is motivation. What are you waiting for? And a last part of the question regarding eating too much: ask yourself "what's so scary about being hungry?" The answer might surprise you. I'm so proud that you all recognize that the cost of bad health outweighs the preemptive costs of taking care of yourself both inside and out. Good on you! Can we all just agree to stop with the fad diets and/or diets that try to change too much all in one fell swoop? Make small changes that can last and that you can live with for the rest of your life. Now I said that the responses would be anonymous, and I will keep my word on that. 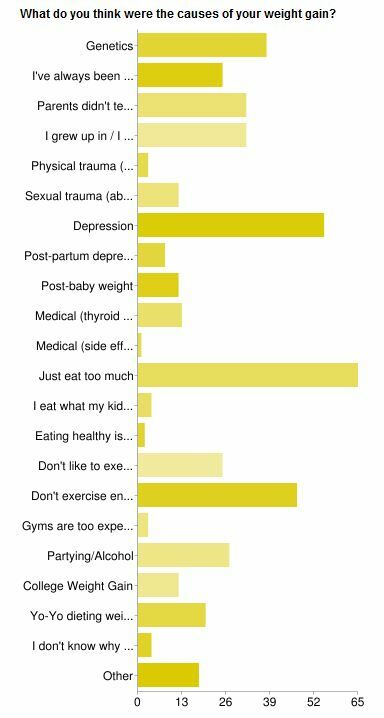 However, I did want to share and address the answers that people wrote in to the question of why you gained weight. Reply: Oh my goodness, I feel you there. But that's not really all day -- it's part of the day. What do you do before/after work to get some movement exercise in? Luckily there are lots of great resources (here's one) that have ideas for sneaking in a few burned calories here and there. Reply: I greatly empathize with all of you. I do not want to be an armchair psychologist (as I'm not licensed and don't want to do any further damage) and so I will preface this with saying "I hope you've found a healthy outlet to discuss these issues and find some healing." I know it's not easy -- but the fact that you're aware of these causes is already a step in the right direction. The one thing I have no hesitation in saying is that each one of you (each one of us) is worthy of having a healthy relationship with your own mind and body, and shame on the people that made you think you didn't. Answer: (1) Marriage; (2) Bad relationship; (3) First heartbreak (yes, really: lame, I know, especially 11 years later... ); and (4) Family members, grandma especially, believing that food = love. Reply: These answers really show the range that our emotions have on eating. Both love and heartbreak causing us to take in extra calories and burn less. Our relationships with other people often change how we see and treat ourselves (for better and for worse). In a perfect world, how we see ourselves and how we treat ourselves wouldn't be affected by other people, but it's not a perfect world. I can only hope that if you're in a healthy relationship, that you can enlist the help of those you love to make choices that reflect not only the love they have for you and the love you have for yourself. If they cannot help you, maybe you need to reassess the relationship. Reply: What do you think you need to start trying? I mean, it doesn't need to be a complete overhaul, just one choice, one step in the right direction. Answer: Original weight gain was because I ate when I was bored when I hit puberty. Other reasons now why I stay fat. Reply: I hear you on the first part of the question. I was a latch key kid from the age of 13 on. Without a structured routine after school, I often found myself migrating to the kitchen. Answer: just want to be/act like my friends who can eat whatever they want without concern of gaining weight. Reply: If all your friends jumped off the Brooklyn Bridge.... Actually -- do you also follow them to the gym? Does your diet for all meals look like theirs? Are you sure they're not concerned with gaining weight? The thing is that what's good for the goose is not always good for the gander. If you trying to eat like your friends makes you overweight/obese, then what good is it really doing you? You can eat what they eat, just reduce the portions, find healthier variations, or just be your own person with your own needs. Your friends won't desert you just because you don't eat everything you do. And if they do give you crap about taking care of yourself, are they really your friends? Thank you for this post. I have to admit, as a certified fitness coach this made me sad. Especially in regards to the person who gave up. I totally get it. one-quater of men and one-half of women are on a "diet" at any given time. 70-90% regain the weight back in one to three years of ending their "diet". What is lacking in the fitness industry is some sort of "continued education." Trainers should a) stress the importance of find exercises that work for their client (whether it's in a gym or in their living room) b) assisting their clients on how to stop dieting and start living a healthy lifestyle. No drastic changes but by starting a few healthy habits and expanding on them over time. I have a similar but different reaction. I've had traumatic injuries that made it so I couldn't exercise for months on end. That made me realize just how precious the ability to move and exercise was to me. But I agree that "continued education" is a very good idea/term for it. So many people don't get reliable information about how to take care of their own bodies. There's no owner's manuals, doctors rarely take the time to get to know their patients and help them (thanks HMOs and malpractice), and there's lots of just plain bad information out there (versus controversial/unproven/preliminary). But i think there's a solution there -- to really open up the resources to people who need the help instead of making them feel like there is no hope. I think of it as changing habits for my life, not a diet. It's not always easy to find the balance, and I still struggle a lot. I get frustrated that I am not where I want to be because I feel like all the energy and time I have spent wanting to be at a different weight/health means I should just wake up and there. Crazy, but that definitely discourages me sometimes. KT80 -- I feel you on this. But it's not a short race, changing your life is a marathon. Mile 22 is never easy.